Last week, although it was in the 70s was a very uncomfortable humid, hilly, 6/12 miles. This week things are looking up for you! The route is shorter, the heat wave has broken, the humidity has lowered, and the course is a lot flatter. while the group may be small since some are on vacation and a contingent of runners headed down to Narragansett for the Blessing of the Fleet 10 Miler. This week we run north on Main St into Wakefield, straight to the water stop at Nick’s Pizza at the Main St, North Ave, Nahant St intersection. If you’re running short, turn around and head back for 6 flat miles. If you’re running long keep heading up Main St, through Wakefield Center and along the right side of Lake Quannapowitt. Keep following the lake, circling counter clockwise by turning left on Lowell St, left onto Quannapowitt Ave through the Converse parking lot (use the path, or go around the building if you want to run a bit longer), out to North Ave, and left on Church St. This will bring you back to the church at the head of the lake. Turn right on Common St along the Wakefield Common back to Main St and ultimately back to the water stop. From there you head south on Main St and that’ll bring you back to Brueggers for a total of 10.7 flat miles. I’ve got the water stops. Simple week, who’s in? ROLL CALL! The Boston.com weather forecast calls for “not as hot” weather for Sunday, 7/21, Week 2 of the Fall 2013 Sunday Long Run. That’s ecouraging after a week that highlighted temperatures topping out at 99 degrees in Boston. This week’s run will be about 12 1/2 miles for the long and 6 for the short. We’ll meet at Brueggers at 8AM when the temperature in Melrose will be about 71 with about 65% humidity. The run will start south down Main St and right on West Wyoming Ave. At Brueggers we’ll go left following the Fellsway East through a few hills, stay right when the street becomes divided and when you reach the rotary at Highland Ave where the newspaper boy sits (I just thought of this, isn’t it dangerous to sell newspapers in a rotary?!) turn right onto Highland, follow the road until you find me (yes me, Jim Carson) at the water stop. Have a sip of ice cold gatorade, powerade, and/or water and head on out for more. The temperature at this time should be in the mid 70s with the humidity dipping down under 60%. 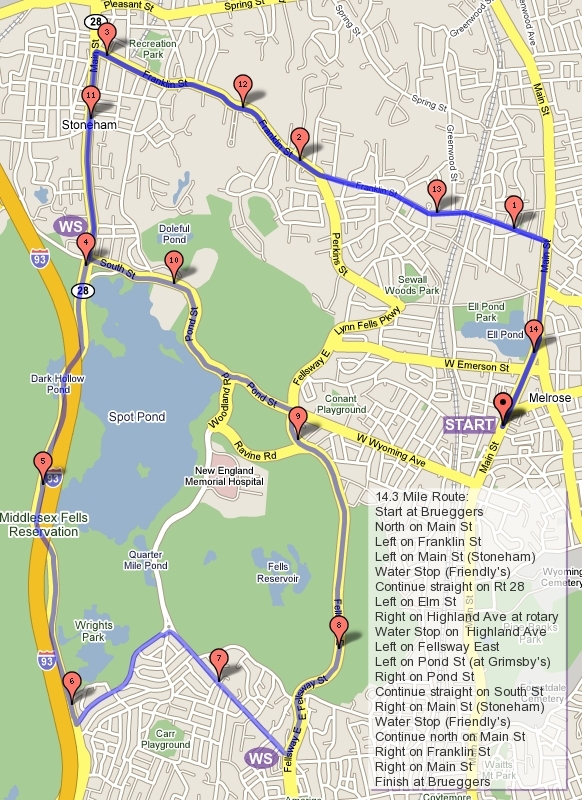 If you’re running long you’ll loop the lake clockwise ( left on Elm St then rights on Main St, through Straw Point Parking Lot, along Pond St, onto Woodland back, and straight onto Highland). If someone would like to volunteer their car we can put some water and cups in it at the Straw Point parking lot on the Stonehame Friendly’s side of the Pond. Anyone? Grab a sip there and continue on around the pond and come back to me at Highland Ave. If you’re running long you’ll split from the group from the water street going straight along the Melrose side of Spot Pond and turn right onto Pond St heading down to Grimsby’s. Take a left at Grimsby’s, follow the Lynn Fells Parkway out past Melrose High School and right onto Melrose St. This cuts you up to Main Street and right back to Brueggers. When the longer runners get back to me you’ll refuel for another trip through hills. While the temperature will climb into the high 70s the humidity will be dropping to less than 50%. So you have that going for you. Take a left onto East Border Road, go up cursing hill (the one spot I allow people to verbally curse while questioning my motives for having you run so many hills) until you get back to the Fellsway East. Turn left there, turn off your cursing, and attack the hills back to Brueggers Grimsby’s. When you get to BrueggersGrimsby’s resist the urge to take a shortcut and keep going straight onto the LynnFells Parkway, out to Melrose High School, right on Melrose St, and right on Main back to Brueggers. It will still be in the 70s when you finish, and the humidity will continue to drop as you get yourself a treat at Brueggers and celebrate another week of training under your belt. So who’s in? ROLL CALL!!!! Welcome to the Fall 2013 Sunday Long Run, starting on Saturday July 13. For those new to the program, each week we meet at Brueggers on Main St in Melrose ready to run by 8AM. We’ll have a very quick review of the days route out on the sidewalk and then send you off. If you aren’t familiar with the Greater Melrose area (Wakefield, Saugus, Stoneham, Winchester) you should bring a copy of the route with you. Hint: keep it in a plastic baggie because the ink tends to run when you sweat. Along the route will be water stops, sometimes hosted by an MRC member, sometimes just a car along the route. Pay attention to the announcements on the sidewalk, we’ll tell you where the cars are. The stops will contain at least water and sports drink, as the runs get longer they’ll have an assortment of snacks to help you through the run as well. To pay for water stop supplies please contribute $2 if you’re running the long run, $1 if you’re running the shorter route, each week. If you plan on running the whole 15 weeks feel free to pay $30 to cover the season. If you have any other questions look over the “About” section at the top of the sidebar on the right. If you still have questions post them here, someone will know the answer. For those not new to the program, welcome back! I’m not in the vicinity of Melrose, so I’m depending on others to start up on Saturday. The route is posted and Lois Parker Carmona and Paul Locke will help coordinate water stops. Please help out if you can. If someone is running the shorter route, consider volunteering for a water stop on your route. Each week we have a roll call. This helps us determine how much we need to stock in the water stop buckets. If you don’t chime in here don’t complain if we run out of water. This also helps us keep a mental note of who’s showing up and who might still be out on the road at the end of the day. Don’t be shy, let us know you’re coming.